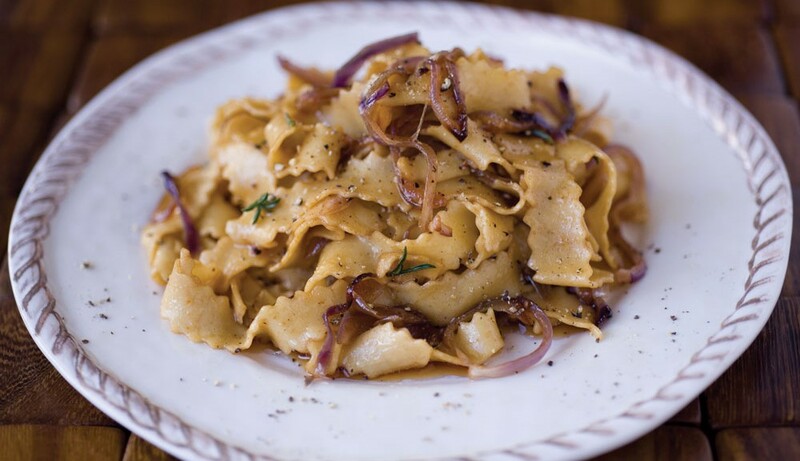 If you’re wondering what to do with those rich juices from your roasted turkey, and you’re tired of soup or risotto, here’s my favorite recipe: an easy to make yet memorable pasta. The savory depth of the meat juices combined with the nutty flavor of the grated Parmigiano results in something far more than the sum of its simple parts. After roasting your turkey, add a few cups of water to that roasting pan, scrape well to deglaze the clinging bits, and cook the juices until rich, then save them for the recipe below. You can even freeze the rich juices in ice cube trays for later use. This is one dish where homemade stock (or the reserved juices from roasted meats) really makes a difference; the store-bought stuff just won’t give you the depth of flavor needed to elevate a simple dish to extraordinary status. And remember: when caramelizing the onions, take it low and slow… no need for sugar, just patience and a low heat and a bit of water to prevent scorching. Make the sauce: Melt the butter over a medium-low flame in a deep, wide saucepan large enough to accommodate the pasta later. Add the onions and rosemary, season with the salt and pepper, and cook until the onions are soft and lightly golden, about 30 minutes, stirring often and adding a bit of water if the onions start to stick; the trick to caramelizing onions is to cook them slowly and to add a bit of moisture as needed. Watch the flame so the onions don’t burn. Transfer the drained pasta to the saucepan and sauté 1 minute over high heat. Add some of the reserved pasta cooking water as needed to thin out the sauce; it should coat the pasta nicely. Stir in the Parmigiano. Drizzle with the olive oil, and adjust the seasoning as needed. Serve hot. Our good friend Bill Bateman just came back from Val d’Aosta, where he goes every winter to ski and enjoy the food and scenery, and we were once again the lucky recipients of some fabulous Fontina cheese he bought while there. What an amazing cheese! It melts incredibly well, and the aroma is subtle, milky, nutty, grassy. Of course I wanted to incorporate the Fontina in as many dishes as I could while it was still fresh from Italy, so here is one recent creation, based on a recipe I found in Gourmet Magazine a few years ago and doctored to my taste. 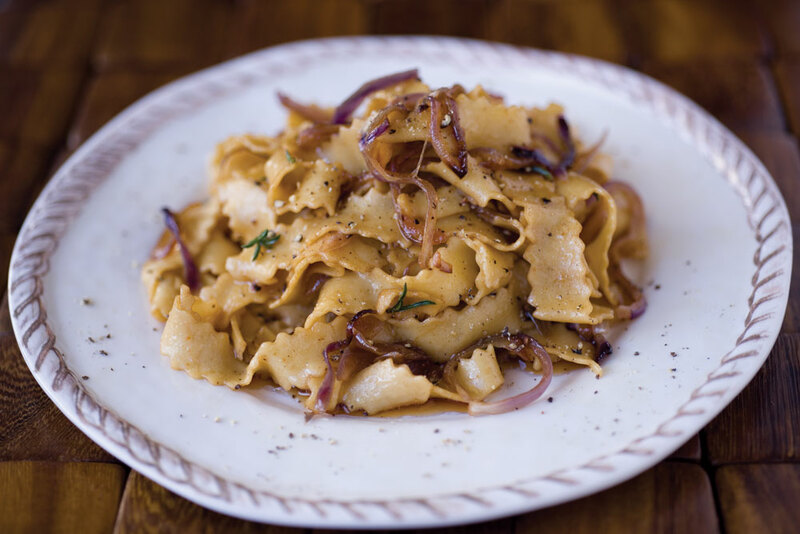 I used homemade egg pasta cut into curly pappardelle for this dish; but you can certainly use store-bought, as long as the pasta is fresh and thin. 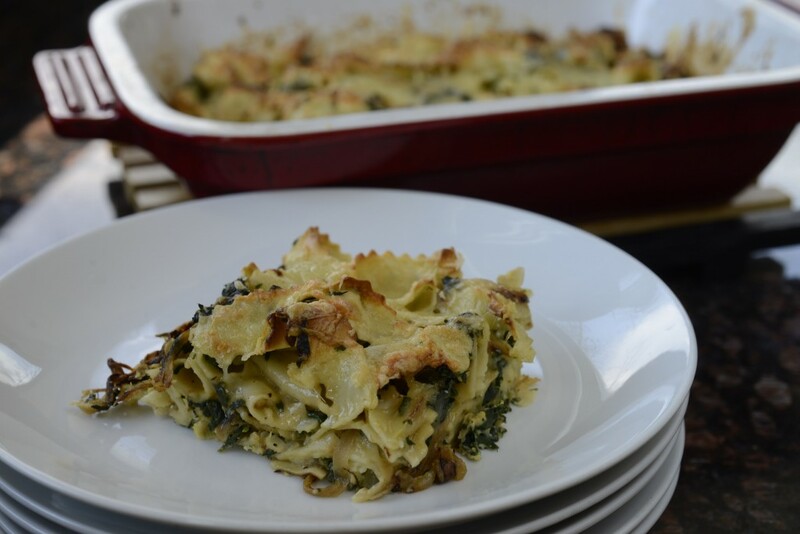 And while I made this dish to showcase Bill’s Fontina, you can use Raclette or Gruyere instead, as these are often easier to find. 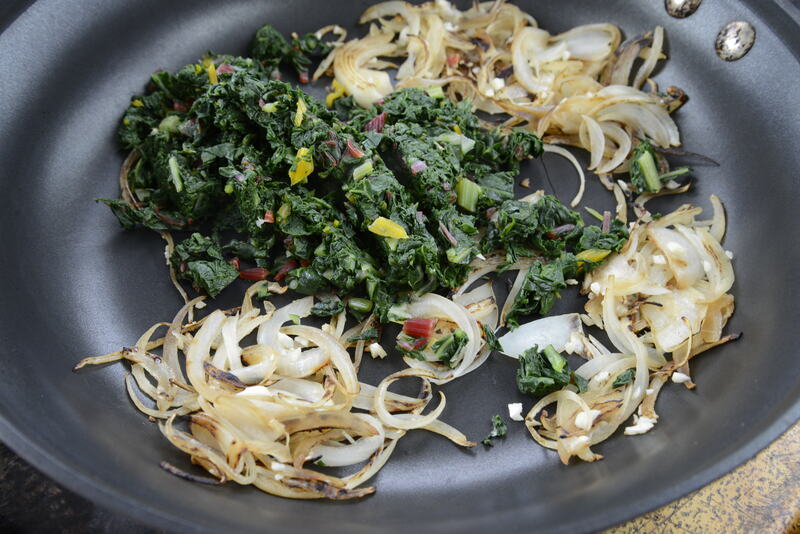 For ideas of how to use your Swiss chard stems (do not throw them out–they are delicious and nutritious! ), see our post on chard stems. Preheat the oven to 350° (preferably set on convection). Bring 3 quarts of water to a boil. 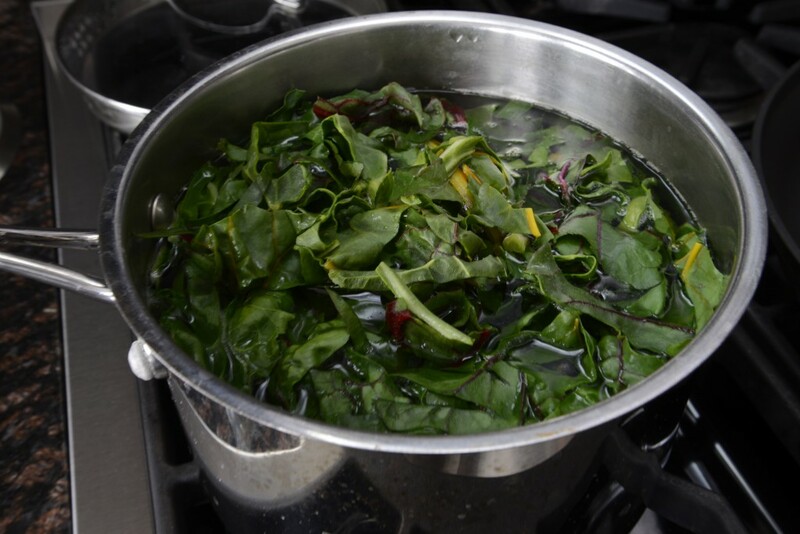 Add the coarsely chopped chard leaves and 2 tablespoons of the salt, and cook 5 minutes, or until soft; remove with a slotted spoon to a bowl of cool water and keep the water boiling. Drain the chard, cool under running water, and squeeze out as much water as possible with your hands. Chop finely and set aside. Add the fresh pasta to the pot of boiling water and cook, until al dente, about 2 minutes; drain and toss with 1 teaspoon of the olive oil and set aside. Meanwhile, place the remaining teaspoon of olive oil in a 12-inch nonstick skillet. Add the onion and garlic, and sauté over medium heat until golden and lightly caramelized, about 10 minutes. Stir in the chard and sauté another 5 minutes, or until the chard is warmed through and wilted. Season with ½ teaspoon of the salt and 1/8 teaspoon of the pepper. Set aside. Brush an oven-to-table roasting pan with olive oil; I find an 8-inch square or 9-inch x 4-inch pan works well. 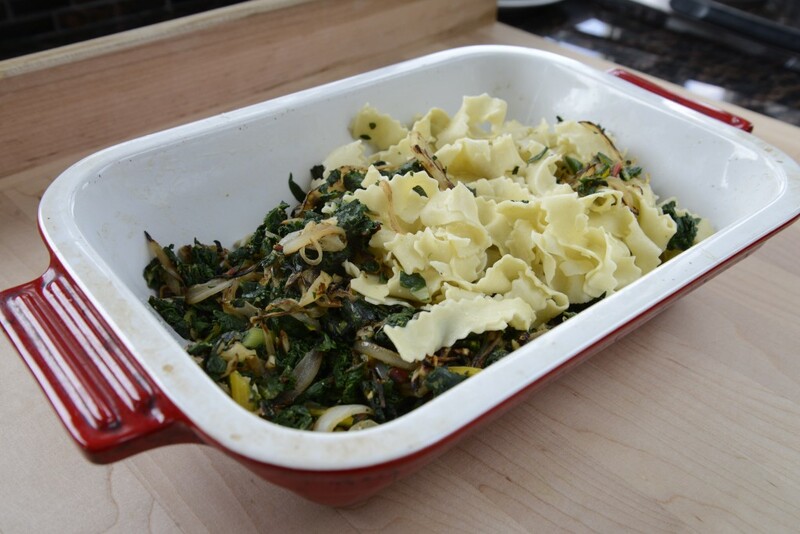 Place the drained pasta and chard mixture in the pan and mix with your hands or tongs. In a bowl, beat the eggs with the milk and Mascarpone; add the remaining ½ teaspoon of salt and 1/8 teaspoon of pepper. The mixture will be lumpy, which is fine; the lumps will dissolve once the pasta is placed in the hot oven. 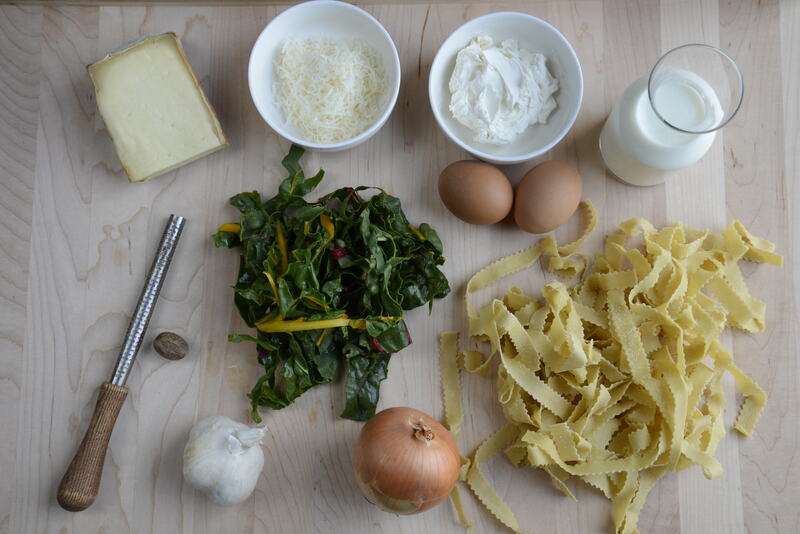 Stir the egg mixture into the pasta and chard. 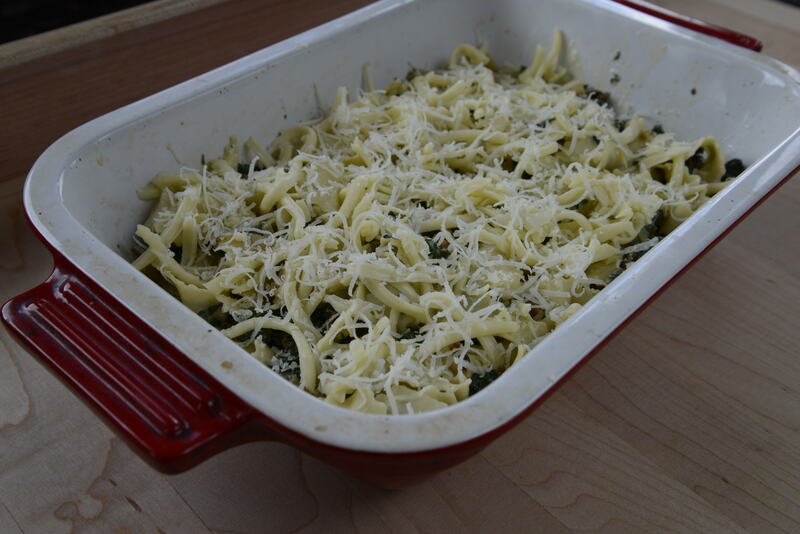 Scatter the Fontina on top of the pasta, and sprinkle with the Parmigiano. Bake in the preheated oven 25 to 30 minutes, or until golden brown on top. 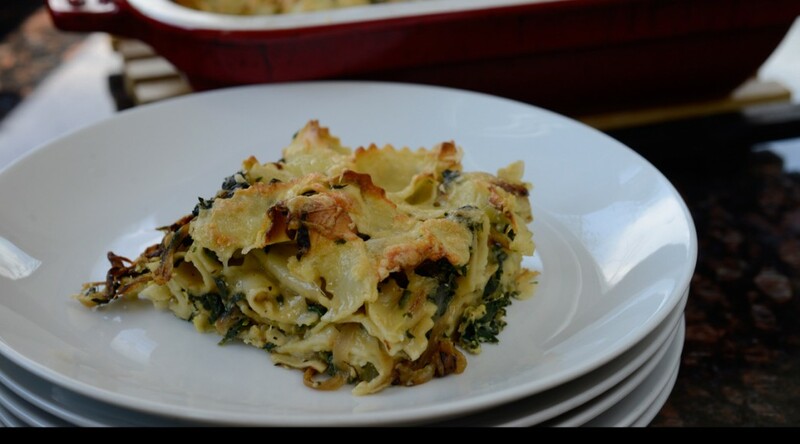 You can slip the pasta under the broiler for 5 minutes for extra crunch on top. Serve hot.